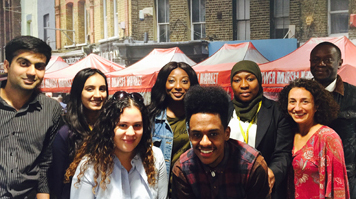 LSBU School of Business students explored consultation services and report writing at the University’s Business Solutions boot camp. The two-day training course, which took place between 31 August and 1 September, saw eight students participate in interactive sessions to help them prepare for the realities of providing consultation services to local businesses from LSBU’s Business Solutions Centre. Run by LSBU’s Student Enterprise team based at the award-winning Clarence Centre for Enterprise and Innovation and the School of Business, students learnt how to write reports for a business audience and role-played business consultation scenarios. LSBU’s Entrepreneur in Residence, Peter Harrington, local Business Improvement District WeAreWaterloo and staff from the Student Enterprise team and School of Business came together to share knowledge and experience in the inclusive training programme, designed to suit the range of skills that LSBU students need to draw on to provide advice to the local business community. The group also explored the workings of LSBU’s Business Solutions Centre – a free drop-in service for local businesses where LSBU’s Business students offer advice and tailored solutions.